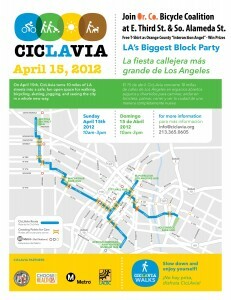 Description: Celebrate 10 miles of car free streets in the heart of the city. 10 miles of roadways will temporarily close to car traffic and open for recreational purposes. 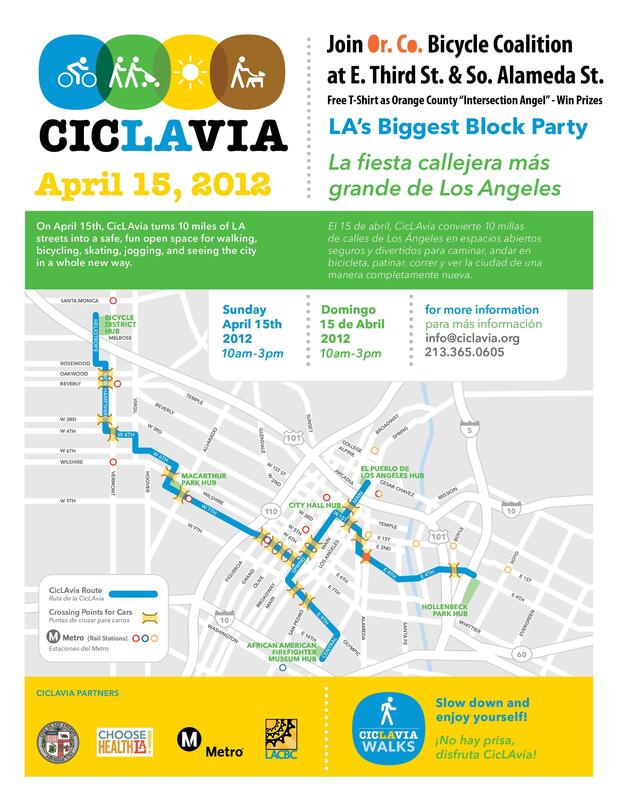 For the first time, we’re going to Exposition Park, Chinatown, Mariachi Plaza in Boyle Heights, and the newly completed Grand Park downtown, where CicLAvia will converge with the inaugural celebration of the park’s performance lawn. Metrolink and Amtrack are two ways to get to Union Station which is about 5 blocks away. 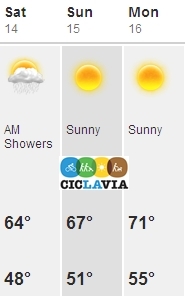 To bike from Union Station to CicLAvia: turn left/south on Alameda, then right on First Street, and you can’t miss it! If you want to rent a bike, Bike Nation is offering bike rentals with a suggested donation, all of the proceeds will go to CicLAvia. The bikes will be available at the Mariachi Plaza Hub and the Grand Park Hub. Click the link to learn more and reserve a rental. Of course, groups could form feeder rides to and from the event! Directions and a map (pdf) to look over might give you some ideas. Could be a great model for something similar here in the OC, a CiclOCia if you will. Which city will be first; Santa Ana, Anaheim, Irvine, HB, Orange? 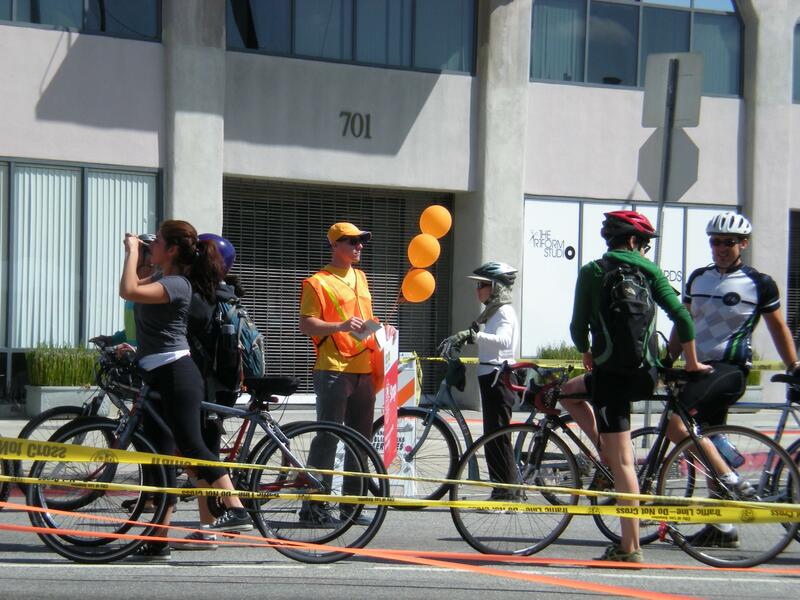 Many thanks to the organizers of CicLAvia for allowing the Orange County Bicycle Coalition to participate in a wonderful day. Let’s do it again, but next time in “our” house! Now if only there were a way to connect the 2 counties in a cross-county “County La Via?” hmmmm maybe someday; the sooner the better, yes? The OCBC would also like to thank and recognize the Sponsors and Volunteers that make events like this possible. Thank you ALL very much! 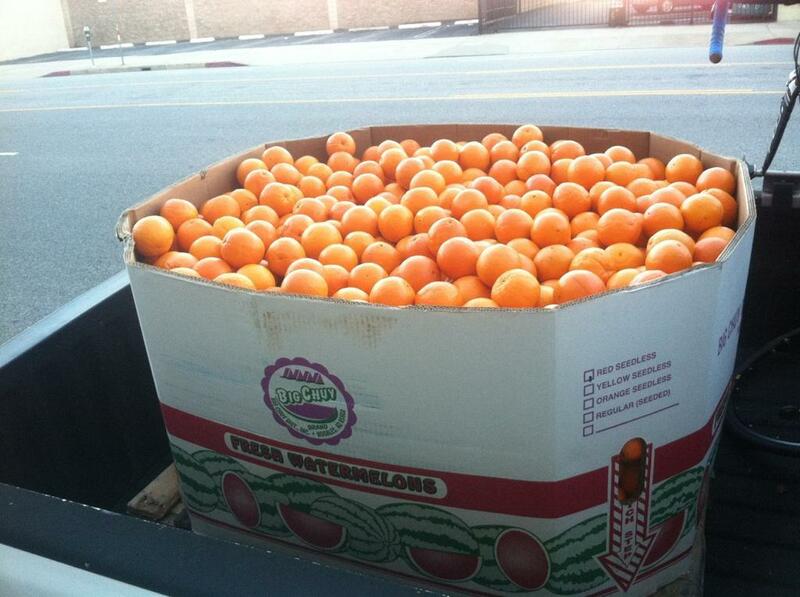 Specifically, we would like to thank Garo’s Produce for donating a bottomless bin of oranges to feed and hydrate the masses for almost 4 hours! They were appreciated very much, and tasty too! 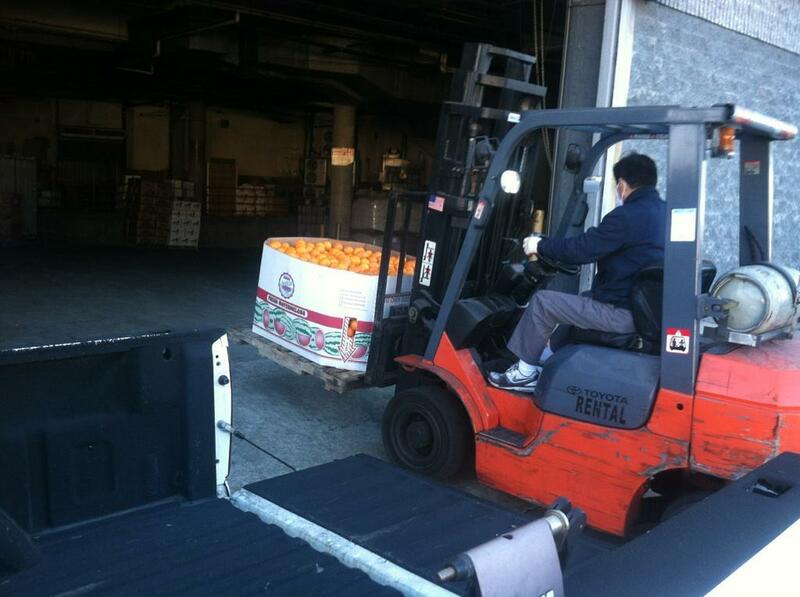 Thanks to Roger Martin from the South Bay Wheelmen who moved the oranges from Garo’s over to Woori Market in Little Tokyo whose management kindly kept them overnight and delivered them to our intersection at lunchtime. Thank You, or perhaps どうもありがとう, or Domo arigato! Thank you to The Home Depot (in Tustin and LA) and ACE Beverage for supplying water, and liquid refreshments, especially the end of day ones (wink, wink, nudge, – say no more)! According to OCBC’s Jim Freibert, “As far as we know, our adopted intersection was the only one giving away any food or water”. Thanks to our Sponsors this was possible, thank you again very much. But we didn’t hand out just food and water! Knott’s Berry Farm, the OC Tourism Council, the CA Visitors Welcome Center in Buena Park, MEDIEVAL TIMES, and PIRATES for their donations of tickets and posters of attractions in the OC. Thanks to Katie for all the balloons (orange of course), which brought some nice color to the cityscape and helped frame our adopted intersection. 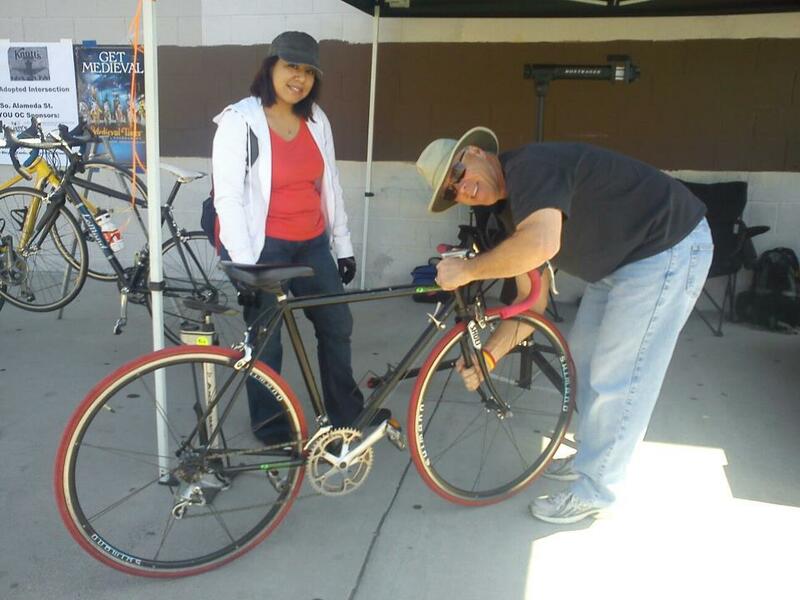 Brian and Jonathan from Jax Bicycle Centers with countless bicycle repairs. The other board member, Vince Buck brought his Daughter Michelle, and her fiancee Brett – all shown in stopping traffic on East 4th Place and East Third Street – while motorized vehicles had the green light on South Alameda. Thanks to Tony and Isabel for passing out water, and several hundred FREE plush toys, mostly bears from Plushland, and Marlene for your help as an Intersection Angel too! 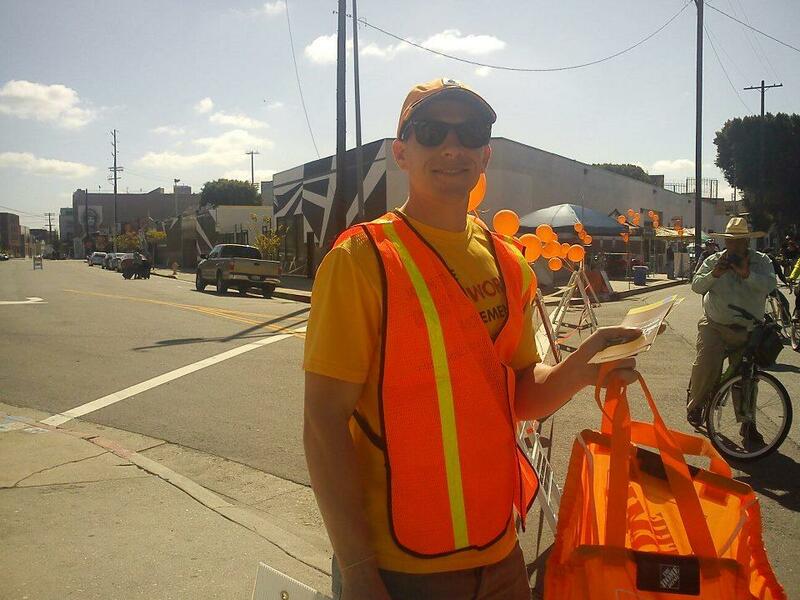 Wes Parsel from the OCTA was the first to arrive, and did double duty like most of our volunteers! Finally, last but not least, two Orange Co (FVSD) teachers, cycling friends Dan, and Jane, with her husband Freddie, and Nick, and Lupi who came to help too! 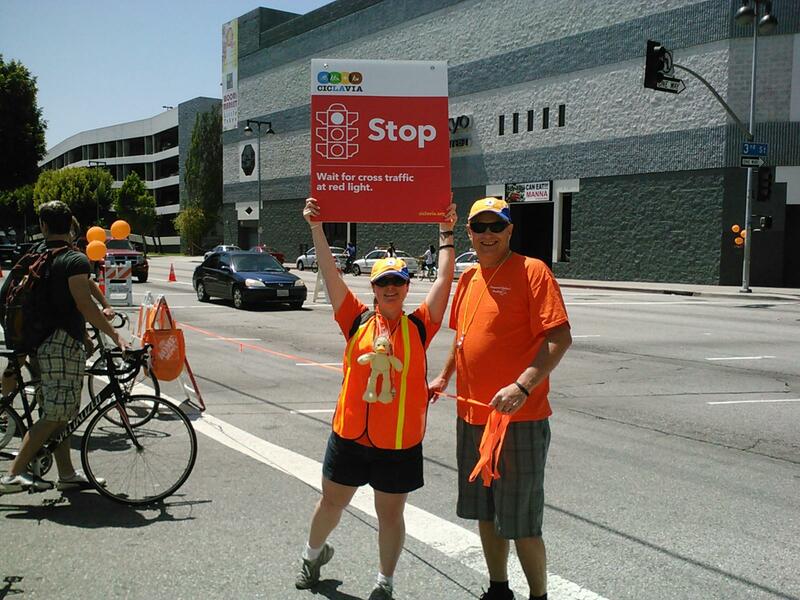 Some of our “Intersection Angels” wore Angels of Anaheim baseball caps, while others wore orange & blue caps from Rabobank, (whose team we’ll being seeing next month at the Tour d California) along with Orange T-shirts, and bright orange safety vests. Thank you all, it was a real learning experience that can be applied to our own CiclOCia! An excellent article from DCStreetsBlog highlights the positive economic impact cyclists provide to communities. Long Beach is mentioned quite a bit in the post as having transformed 4 business districts into cycle friendly areas complete with merchant bike-share programs, discounts to customers arriving by bike, bike valets, and a sea change in business owner’s perceptions about cycling and profits. Really though it’s a “no brainer”, to vanquish fear and get business owner’s buy-in all you have to do is show them the money! process that can be guided to positive results. These are the “good old days”! give you 12 in return? On a 1:1 basis, or even a 4:1 basis, installing cycling infrastructure will lead to joy and discovery among disposable cash spending cyclists. Creating a bike corral in the space of 1 car’s parking spot, at least 12 bicycles are able to be parked. So in exchange for 1 spot and even 4 (3 passengers) customers using that space, you now have 12! Cyclists spend less (on average) on car maintenance by definition – they are cyclists and drive less. Some are completely car free! Less maintenance costs (for them) turns into more disposable cash; generating business and profits for you (the owner). As an added benefit, more of that cash remains within the city or community – a win for everyone! According to a 2011 AAA news release the average cost of owning and maintaining a car sits around $8,000 a year. Of that, only 16% is retained within the local economy (which you can read about here). health expense and more disposable income. Ya But…ok you want more? St. Louis: Washington University quantified the economic benefit of their Ciclovia (open streets) as a net positive. New York: Car free Times Square generates more than 10% of The City’s economic activity. More cars != more profit. As simple as that. Leadville, Colorado: A 19% increase in sales tax revenues after opening of the Mineral Belt Trail (and more). Dunedin, Florida: 35% storefront vacancy into turned into 100% occupied after completion of the Pinellas Trail. Property Values: Increase 11% near bikepaths according to April Economides (a consultant to Long Beach). San Clemente has become a shining star by adopting into its General Plan its Bicycle and Pedestrian Master Plan. Cycling advocates throughout the County can and should get their city councils to do the same. Which city or town will be next to embrace the sustainable future? We can help, you can use the comments below or visit: Contact us. When you ride your bike to a local business and there’s no bike rack, do you find the manager and explain to them that you would appreciate a bike rack near their business? Success builds on success, sometimes starting with one rack, or corral in one parking lot at a time. More towns, cities, and counties nationwide are discovering the sustainability and profitability of cycling friendly environs. It’s a sea change all right, and a welcome one at that. 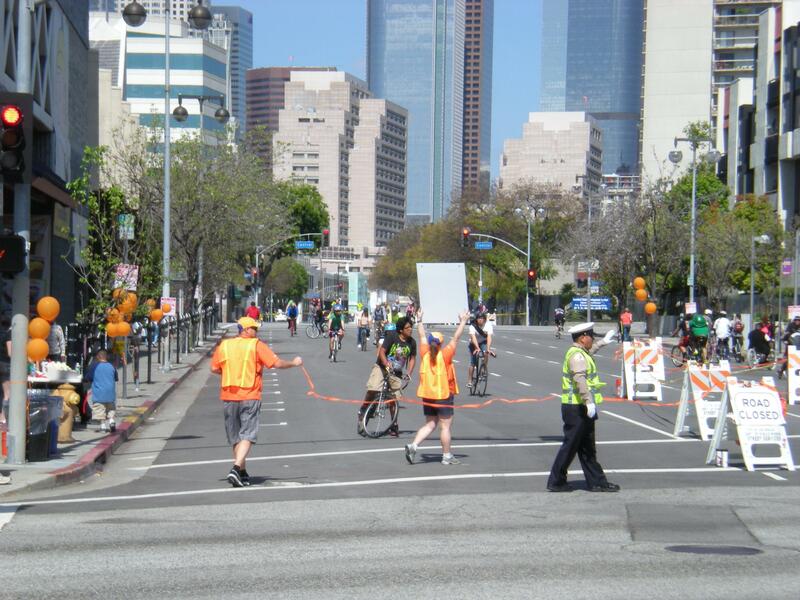 The OCBC is looking for volunteers to help staff and provide support for the 4th CicLAvia this Sunday April 15th. If we work in “mini-shifts” then we can also ride and support the event. Who knows, you might even bring a bit of the magic to the OC to kindle the flame of inspiration for our own CiclOCia! To volunteer Leave a Comment, we’ll confirm via e-mail. If you’re looking for something to do the 15th, this is it. Pay it forward and get in on the fun! Not only will you be helping a great cause succeed, you will bring back the seeds to plant and germinate here in the OC. If we get enough people from a similar location, perhaps we could get a car, or vanpooly thing going. 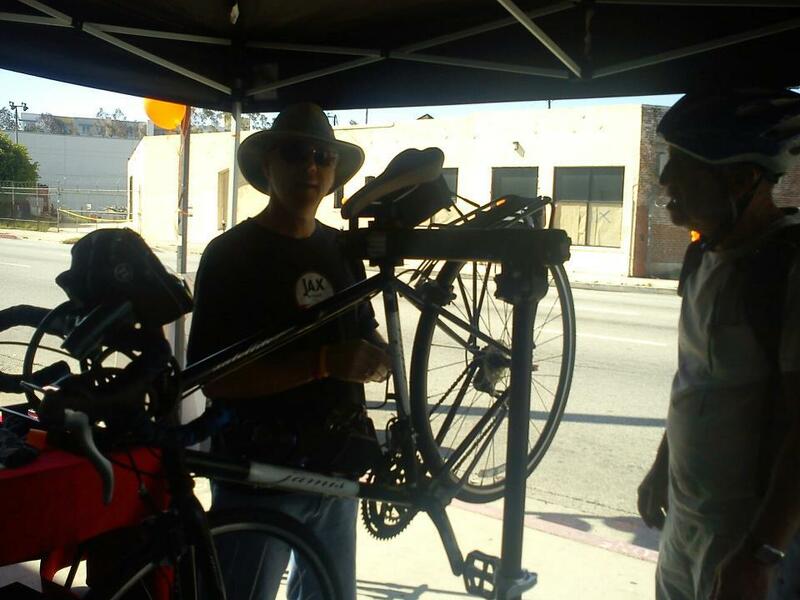 Update: for those not sure about taking their own bikes, rentals are available at the following places: Bike Nation USA, Flying Pigeon, Downtown LA Bikes, and DTLA Bikes.